Gottfredson has held the number-two spot at Irvine since 2000. There he led a major expansion of the university’s infrastructure, blending state, campus, and private support. He helped create the California Institute for Telecommunications and Technology, including the construction of a $55-million research facility, and the establishment of a new public law school. His tenure at Irvine was also distinguished by leading efforts to significantly raise enrollment, increase numbers of women and under-represented minority faculty members and administrators, expand degree programs, and enhance the undergraduate experience within a large research university. 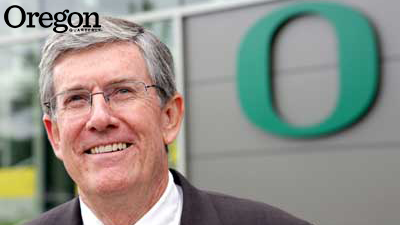 The accelerated search process resulting in Gottfredson’s appointment was conducted by a twenty-two-member committee led by state board member Allyn Ford; it included another board member, UO faculty and staff members, alumni, students, and business leaders. The committee advanced three candidates to OUS chancellor George Pernsteiner, who, based on the committee’s recommendations, presented Gottfredson to the board as the sole finalist. Figuring out how to strike that balance promises to be among the first challenges facing the new president, who is expected to continue the push for an independent governing board and changes to the University’s funding system that were initiated by Lariviere and supported by Berdahl. Previously, Gottfredson spent fifteen years at the University of Arizona, where he served as interim senior vice president for academic affairs and provost, vice provost, and vice president of undergraduate education. He also held positions at the Claremont Graduate School in California, the University of Illinois at Urbana-Champaign, and the State University of New York at Albany, where he earned his MA and PhD. A respected figure in the field of criminology, he has remained active academically throughout nearly three decades as an administrator, and is coauthor, with Travis Hirschi, of the 1990 book A General Theory of Crime, which correlates criminality with the absence of self-control and remains a standard in the field.